Front row: Marit Tinglestad, Julie Zentner, Chris HAyden,Betty Dame (Most Improved), Kit McKorson, Sherrie Crow, Michelle Flury, Rob Phelen (Assisstant Coach). Second row: Lori Clark (Assisstant Coach), Candi Carlson, Audra Hammerschmidt, Sharon WIlson (MVP), Lisa Hertich, Denise Thomas,Deidre Sewell, Lorijo Claunch. 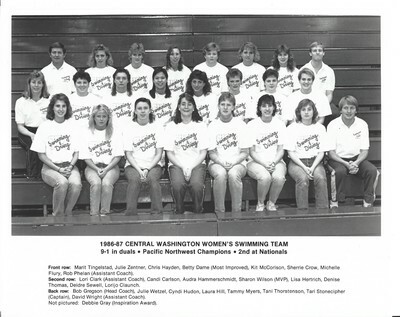 Back row: Bob Gregson (Head Coach), Julie Wetzel,Cyndi Hudon, Laura Hill, Tammy Myers, Tani Thorstenson, Tari Stonecipher (Captain), David Wright (Assistant Coach). not pictured: Debbie Gray (Inspiration Award).